LAWRENCE – Responding to the state’s increasing Somali-speaking population, the University of Kansas will soon be one of the first universities in the country to provide language training in Somali. Since the 1990s, when Somalia was torn apart by Civil War, the United States has seen an increasing number of Somali immigrants. Several thousand Somali speakers live in southwest Kansas, attracted to jobs in the region’s meat-packing industry. More than 5,000 Somali immigrants are in the Kansas City metro area, a population that continues to grow as immigrants move to a city where friends and family have already put down roots. An elementary Somali language class will be offered at the Summer African Language Institute, a KU program through the Kansas African Studies Center and the Department of African and African-American Studies. In the fall and spring, more advanced Somali language classes will be taught. The university sees a need for more Somali speakers, MacGonagle said, pointing to KU graduate student Abdifatah Shafat, who during the summer of 2012 provided outreach to Somali immigrants in southwest Kansas through the Finney County Community Health Center. By Shafat’s estimates, of the nearly 700 Somali speaking immigrants who worked in Garden City’s meat-packing plants, just two had strong English-speaking skills. Those two Somali speakers worked for the meat-packing plant full-time and were not available for community translation. That summer, Shafat traveled to hospitals, courts, schools and police stations translating for Somali speakers. Shafat grew up speaking Somali in northern Kenya. After he left Garden City, his employer wanted to hire a translator but couldn’t find anyone who could speak both English and Somali. “There is a huge need for it,” Shafat said of Somali language training. With the inclusion of Somali, KU, which already offers Arabic, Kiswahili and Amharic language programs, will broaden its strong focus on the Horn of Africa. Somali natives aren’t the only ones who speak the language. In a part of the world where most are fluent in two or more languages, Somali is widely spoken in the neighboring countries of Kenya, Ethiopia and Djibouti as well as throughout the Middle East. Along with providing connections to Somali speakers in the region, MacGonagle said the course would be useful to students wanting to work abroad and those studying business, medicine, journalism and law. The course also has received interest from those at nearby Fort Leavenworth, which is home to the U.S. Army Command and General Staff College and Foreign Military Studies Office. Learning Somali will be an opportunity for the U.S. military community to expand their study of African languages and cultures, MacGonagle said. KU teaches 40 languages, more than any other Big 12 school and more than any other university between the Mississippi River and Rocky Mountains. 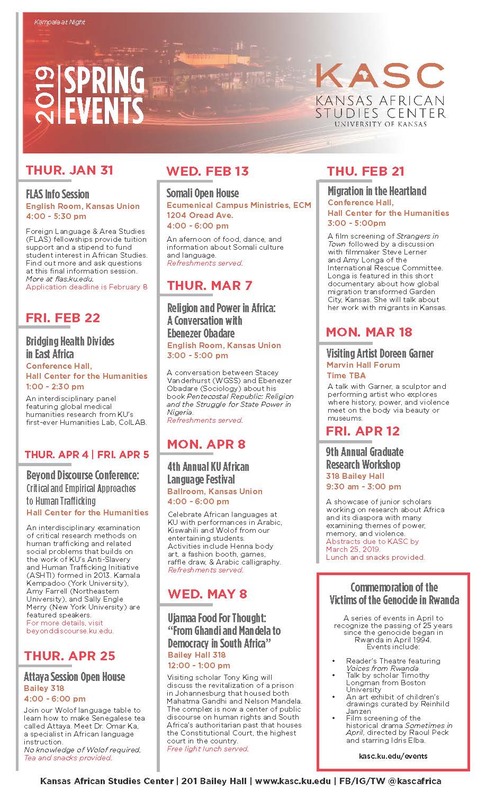 More information on the Somali summer course, open to KU students and other students and professionals, can be found on the Kansas African Studies Center website.